Has it really been months since I last looked at anything from Black Butterfly in Prescott? I guess I'm just not in Prescott as often as I used to be, so it's getting a little more difficult to work in a chocolate shop trip while I'm there. Today I have two truffles and two types of bark. We'll start with the Creme Brûlée truffle. The shape is a half circle, with white chocolate on the bottom and milk chocolate on the top. Naturally, then, it's nice and sweet. I feel like there is a slight lemony taste, as well; I don't know if that's just me. On the inside is a white ganache of sorts with a type of caramel on top. There are also tiny, crunchy, sugar bits in there to represent the brûlée topping. Not as rich as some white chocolates can be. Sweet in a positive and not overwhelming sense. So overall nice and pleasant and definitely evocative of creme brûlée. I believe the other was a Maple Pecan. Its shape is more of a raised dome, like a cherry cordial. 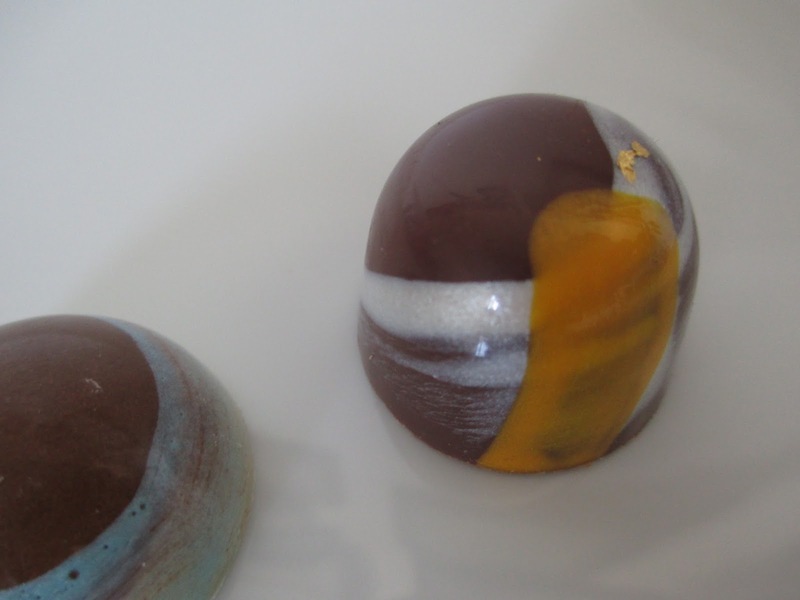 Milk chocolate with a white swirl, then a yellow slash and a spot of gold. Simple and subtle and yet so artsy and not minimalist. Pecans have such a recognizable earthiness and sweetness, and combined with the milk chocolate, the effect is warm and sweet and rich. Tiny pecan pieces give the truffle full pecan flavor, and the ganache is much richer than I might have expected. This last effect works particularly well: milk chocolate is good and so I never want to say that dark chocolate is "better" when it all depends on a variety of factors. This is an example of milk chocolate doing the type of thing more generally associated with dark chocolate. Maybe this truffle is more straightforward than the Creme Brûlée, but the accumulation of factors that won me over meant that this one is just an ultimate personal favorite for me. Now on to the bark. I have had some bark from Black Butterfly before; I've just never reviewed any of it. The first is the Eggnog Pecan, which immediately caught my eye with its prettiness and because I've been trying a bit of eggnog chocolate lately. Probably also the pecans appealed to me, naturally. With the bark, you can buy either a box of it or just a piece from the case where the truffles are. This piece ended up being about three dollars, and since the truffles come in at the average price of $2.50 each, if you are worried that you'll just finish them off in one bite, try the bark instead. It's a great alternative if you're not necessarily a truffle person. On first taste, I found this bark a perfect representation of the taste of eggnog, absolutely stellar, just maybe less thick and eggy. But then maybe halfway through, I started to get a weird taste. I can't quite place it. Is it nutmeg? Is it the egg element? I don't know, and it isn't exactly strong and it's probably just me finding it odd, but this flavor is keeping me from enjoying this bark as much as I'd wanted to. Other than that, this is still a good bark. Along with the pecans, there are also some candy pieces that are halfway between caramel and toffee. They're like that hard caramel that becomes flexible the moment it reaches your mouth; that makes for a fun texture element. Except when you get the big pieces of them, they don't add much to the flavor, and the pecans don't necessarily, either--but it's one of those things where you'd notice if they weren't there. Lastly, I'm enjoying the fact that this is white chocolate bark, given that I'm kind of on a roll to find and enjoy more white chocolate these days. Now for a dark chocolate bark, we have a Cardamom Pistachio piece. This is the one of the three pieces I'm reviewing today that I didn't specifically choose myself, but as long as there was some around, I might as well sneak a piece to review, right? It's quite pretty, with the pistachios mainly on the inside and salt and rose petals up on top. Now, while I wouldn't say that I specifically dislike cardamom, I can be hesitant around cardamom. Often I don't like the overall effect of dishes that contain cardamom (or maybe the flavors that tend to be mixed with cardamom), and it is such a strong spice that it can be overwhelming. Here I wouldn't exactly say that the cardamom is subtle, but it's also not so strong that it overpowers you. The pistachios add an element that I tend to come across less often in chocolate, and the salt adds that little zing here and there. I don't know that I specifically taste the rose petals but again, I might notice their absence. The dark chocolate isn't bitter: it's just stable and strong enough to be able to keep up with the strong flavors the cardamom and pistachio. So while it's dark, it makes you think of sweeter things (like chai) because it's full of spices and nuts and flowers. These were the weirdest collection of flavors for me to put in one review, weren't they? Or maybe not. Some fall feeling with the pecans, some winter with the eggnog, and some dessert with the creme brûlée, and some spices with the cardamom bark. Colorful, visual flavors, that's what we covered today. And that really is the heart of Black Butterfly: Tracy Taylor has this way of putting together flavors that always keeps me eager to try more, because I feel like I'm getting something each time that I haven't had before. There is such style to the flavors that she put together. I'm a writer with a tenacious tendency toward the random, which leads to the all-inclusive Delirious Documentations style. In college, I studied literature, so I often focus on the realm of books. 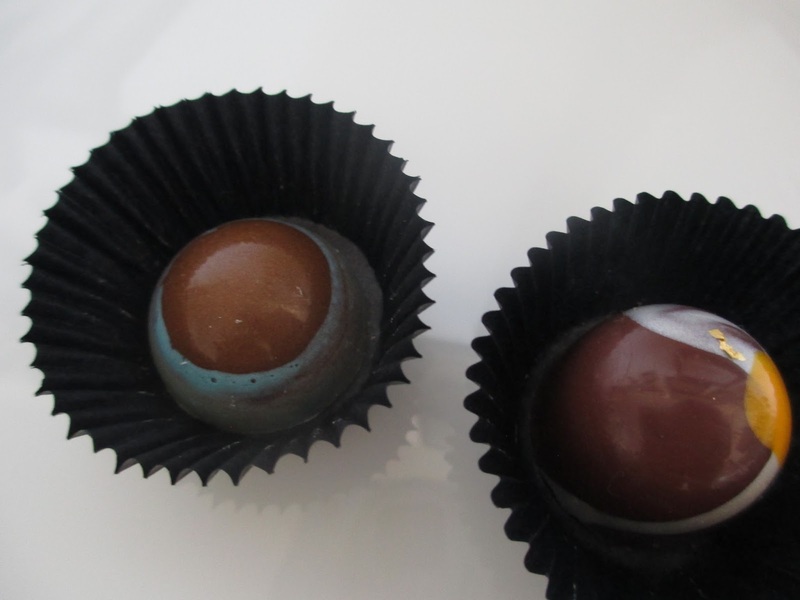 I also post a new chocolate review about once a week. Along the way, anything and everything else that I'm thinking about or enjoying may make its way in. But isn’t the randomness what makes it all fun? Follow @deannaskaggs for updates and be sure and check out my book. Share book reviews and ratings with Deanna, and even join a book club on Goodreads.